Many of you have emailed and requested another Frugal Fashionista Fashion Show. Well, your wish is my command. This Friday, January 28th, I invite you to come link up your post that showcase your Frugal Fashionista finds. As much as I love inexpensive pieces from the store’s clearance rack, I ask that the outfits you share with us showcase at least one or two second hand treasures (shirt, skirt, jacket, pants, jeans, accessories etc.) The more the merrier. This can be such an encouragement to others who are still contemplating if shopping like this is for them, and reassuring them that I am not the only one who finds great treasures in the clothing department. If you’re interested to share how long you’ve been a Frugal Fashionista, where you’ve been inspired to give this second hand thing a try and of course, how much you paid for those frugal fashion finds, I’d love to hear. If you don’t have a blog, but want to join in, feel free to email me with your picture, and a paragraph description that I can include in my post. I can’t guarantee that I can fit them all in this week, but I’ll give it a shot. Here’s my outfit for this week. This is the first year I found some great jackets. At one yard sale, a lady sold three, 3/4 quarter length sleeve jackets that fit perfectly. At $3/piece, I grabbed them all, but only have pictures of this one. Paired with a thrift store black shirt, yard sale jeans, $3 Target hoop earrings, and a $2 glass necklace, this jacket can be dressed up for an evening out, or worn with jeans, for a dressed down look. Since I didn’t have many 3/4 length shirts that would work under this jacket, here’s an example of how a Frugal Fashionista gets creative. While most ask “What Should I wear,” and assumes another shirt must be purchased to make the outfit work, we shop our closet and pocket the saved dollars. 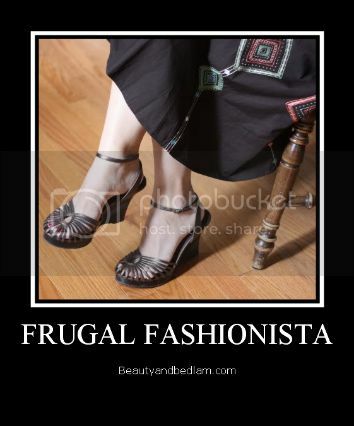 I look forward to having you join us in our first Frugal Fashionista Fashion Show of 2011. I can’t wait to see what you will share this Friday. @Clare, that’s a good idea..I can plan on doing another one for just great deals. You can definitely do a kids post. It doesn’t have to be adult outfits only. Love the outfit, but I have to say dark jeans or black/dk. gray pants of some type would be an improvement in my opinion. You obviously were going for a more casual look. Love that you are doing this…Your frugal fashionista posts always inspire me to make a little more effort when I get dressed! You are such an encouragement to find ways to live frugal. These are great! Ok, at 27 weeks pregnant with my fourth, I can’t say I want to change my clothes several times and try to get pictures (too much energy and bending over), BUT I am wearing almost all thrifted clothing – some maternity, some sizes and styles I don’t usually wear – and always feel better when I actually put on an “outfit” than when I just wear sweats. 🙂 So, for you, I’ll try to get a post together this week! oh Timmi – TRUST me, I know. I feel SO ridiculous every time I do a post, but the one time I tried to just show the outfit, then everyone complained they wanted to see it on. ha! Feel free to just show it and not “model” it….others have done the same. It’s okay! No one is judging here! We are all just sharing our experiences and I PROMISE your post will be an inspiration to someone else! I keep telling myself that! OK! I wasn’t sure if just showing was an option. I’d be a lot more comfortable with that. By the way, you’ve also been an inspiration to my daughter. We have a date to go thrifting together next week!